Each year CAMNES with the complicity of the Christmas spirit organizes a special evening open to everyone and dedicated to its faithful audience. Every Christmas Conference focuses on a topic tangent archeology and the ancient studies, but of great curiosity, fascination and popular interest. This year CAMNES decided to dedicate their Christmas Conference to Agatha Christie, the mystery writer par excellence, which few people know as the wife of one of the greatest archaeologists of the past, Max Mallowan. Not only Agatha Christie has used the knowledge of her husband and was left inspired by his pioneering expeditions in the Middle East, the famous author followed her husband for two decades writing novels and experiencing firsthand some adventures and exceptional archaeological finds as well as participating to the excavations. As shown in last year’s Christmas Conference, 'Investigating the Past', archaeological investigation is extremely similar to Police investigation. Who better than Agatha Christie embodies this dual approach in the reconstruction of past events? 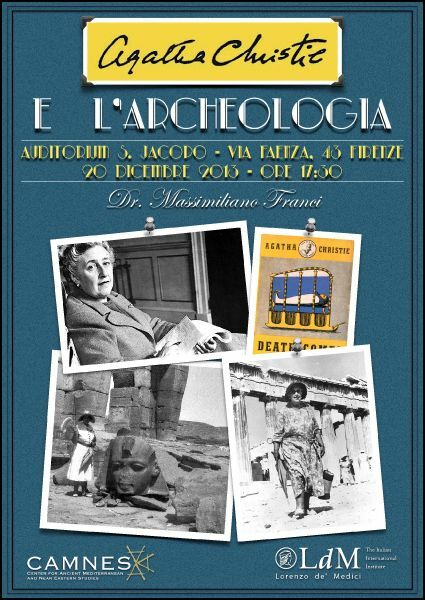 The conference will be presented by Dr. Massimiliano Franci of CAMNES, Egyptologist and philologist that many have already known as the curator of the CAMNES 2nd Cycle of Archaeological Lessons dedicated to the ancient Egypt, and will be held Friday, December 20th, at 17:30 at the LdM Auditorium S. Jacopo in Via Faenza, 43 Florence (Italy).